Riendeau, educated as a behavioral scientist, also plays guitar, creates large art sculptures, and is a published book author. 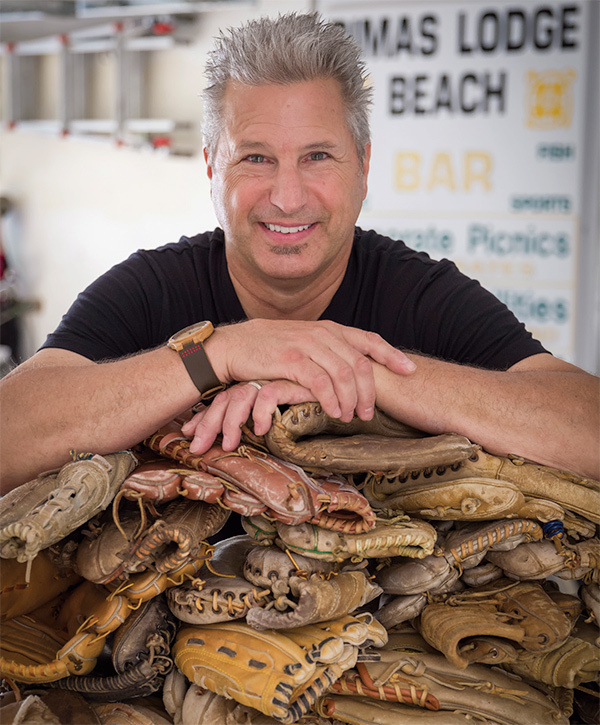 Most recently, he uses his spare time to stop at garage sales, hunting for old baseball gloves for the latest in his ongoing journey in the creative arts. We talked with the creator of Lucky Savage Leather Goods—the products he makes from his garage sale finds—to see what this latest project is all about and what motivates him to carry on with his one-of-a-kind Renaissance journey. QB: Lucky Savage, your leather goods brand, is just getting started. What is your day job? The one that pays the bills? RR: My day job is my longtime work as an executive search professional. Since 1985, I’ve been in the search business—as a partner in a larger firm, then my East Wing Group was acquired by a top-four global firm, DHR International/Jobplex, and most recently, the entrepreneur in me went back to a solo search practice, forming New Frontier Search Company, here in Barrington. The search profession is an intriguing business and challenges me in so many ways—as a business professional—as well as utilizing my knowledge as a behavioral psychologist. QB: How does your leather goods avocation feed the rest of your life? RR: Growing up in the late 1960s and early 1970s, I was always making something—tree forts, wooden rafts, and bows and arrows out of tree limbs along Salt Creek that ran behind our house in Rolling Meadows, where I grew up—anything that kept us outside and kept us busy. As the oldest of five boys, I’m sure my mom was happy to get all of us out of the house. Imagining something or building something (I was a homebuilder out of high school for nine years), creating a sculpture, an art piece, writing a book, a cartoon panel, an original piece of music, or drawing a bright picture is a very deep part of who I am as a person. The freedom I feel in drawing and simply allowing myself to consider for a moment how something would look if… is empowering to me. It is intoxicating to me to see if I can create some physical piece to express my whimsical idea, or expression of simply having fun. Today, that same passion for creating something that was not there yesterday is very alive in me. I am at my most satisfied the moment an idea or project is just about done. It doesn’t get any better than that for me. Russ Riendeau can create a custom leather item in three hours. After he disassembles the leather goods using various tools, he determines what he will create. A stitching pony can be stabilized on a tabletop, bench seat, or on his lap for stitching. He is pictured here in his secret Lucky Savage headquarters. QB: Do you prefer to work on one creative endeavor at a time, or do you multi-task? RR: For me, it can depend on the seasons and my ability to work outside. I find I do more writing, drawing, and Lucky Savage work in the fall and winter, as it’s conducive to indoor work and easier to not be distracted by nice weather and my motorcycle calling my name! The nicer weather also allows me more time and access to sourcing recycled wood, leather, and baseball gloves that I can’t find in the winter. It’s a lot easier to get out of a dumpster when it’s not slippery from snow and rain! I do like to have many different pieces going at one time, as each piece may need time to dry. Or, I need a part I can’t find. Or I get stuck and need to let it sit for more inspiration. Or I use up my weekly allowance and have to do more chores to get cash to buy more supplies. QB: How did the idea come to you to create the Lucky Savage items? RR: Lucky Savage Leather Goods is the official name I’ve given my brand. I had a childhood friend named John Savage and he was sort of mysterious and for whatever reason the name “Lucky Savage” came to mind. I felt it was fun and appropriate for leather goods like this. I’m working on a book, as well, that will chronicle the Adventures of Lucky Savage! QB: You call this useable art. RR: My vision was that these items were designed to be shown off—not to be kept in your pocket or purse or jacket—but to be proudly displayed on the restaurant table, the bar, the desk, the conference room table, to be seen, begging the question, “Hey, where did you get that cool wallet? !” Lucky Savage is useable art—a personal piece that reflects the owner’s passion for art, for baseball, for unique gifts, and for repurposing old material. The products are not always the easiest to use, but they will capture the attention of others and help carry the conversation to fun places. I’m also starting to do some products using a combination baseball gloves, old leather footballs, and even vintage leather hockey gloves to create wallets and business card holders. QB: When did the idea first appear for you? RR: It started during the Cub’s run to win the World Series. After the Cub’s won, I wrote a book, “THE BIG SWING: What The Chicago Cubs Are Teaching Business Leaders About Capitalism, Commitment & Culture”. I saw some of these wallets made from baseball gloves on Etsy and Pintrest and had the idea of making these wallets and cardholders to hold a thumbdrive of the book that I could offer to potential search clients. When I saw the strong response from people that received ones I sent them, that was all I needed as inspiration to take it to the next level and start to make more and sell them online. I also get calls from strangers and friends, asking me to make accessories out of their old gloves. One gentleman called me, saying one of his sons died a few years ago and he wanted me to make some keepsake items for him and his wife and other sons. That was a pretty emotional exercise I wasn’t ready for. QB: Are you self-taught in leather work? RR: I am all self-taught, with holes in my fingers to prove it! Cheryl is a skilled seamstress and she’s taught me a lot, and my mom, as well, was an avid seamstress and taught me to handle a needle and thread as a kid. Leather working is a lot about punching, assembling, lacing, and sewing. I am learning to pace myself. My hands cramp up a lot and my back gets stiff if I work too long at a time. But it’s fun work and time flies. Left: 1960s Vintage Sears baseball glove wallet. Middle: Show-off pieces to carry the conversation. Right: An Easton baseball glove is now a pouch. A hook secures keys. QB: What role in the designs does Cheryl have? RR: Cheryl has a great sense of style and proportion. She shares ideas on the attention to detail—where a red snap may be a perfect color, or perhaps a looping stitch with red thread would accent the color or design of the piece. After 37 years of marriage we are a great team. She is my greatest eye for color, balance, proportions, and practicality, so she is a very big part of the Lucky Savage fun behind the scenes. She and our daughter, Danielle, are great photographers and often do shoots for me and website design work. QB: What is so inspiring about this leather goods project to you? RR: I played baseball as a kid and am a diehard Cubs fan. I understand the importance and personal attachment people have to a piece of equipment that is used and held like a baseball glove, a hockey stick, a pool cue, a water ski, or tennis racquet. These are personal and become a part of the athlete. The aroma of the leather and lacing from sweat, dirt, oil, perfume, cologne, mustard—all those fragrances—immediately take the person back to their youth when they smell a Lucky Savage product. They smell it first! QB: Can people have you repurpose their baseball gloves into something special? RR: I really love when people call me and trust me enough to mail their gloves for me to make them a custom piece. I am honored by their trust. I can be reached on my cell at 847-363-9789, or russriendeau@gmail.com, or www.luckysavageleather.com.